The Porsche 962 was based on the 956 and intended for IMSA GTP class competition. To prepare the car for competition, the vehicle required changes to bring it into alignment with ever-changing rules and regulations. For 1984, rules stated that the pedal box had to be mounted behind the front axle. To comply, the wheelbase of the 956 was extended to accommodate additional space. A steel roll cage was also integrated into the car at the time. Porsche had to find a replacement for the twin K27 turbochargers since twin-turbo's did not comply with GTP class racing regulations at the time. In its place, a single Kühnle, Kopp und Kausch AG K36 turbocharger was fitted. The newer 3.2L fuel injected Flat-6 would be placed in the 962 by the middle of 1985 for IMSA GT. It would not be until 1986 that the 2.6L unit from the 956 was replaced in the World Sportscar Championship, using 2.8L, 3.0L, and 3.2L variants with dual turbochargers. The cars run under World Sportscar Championship regulations were designated as 962C to separate them from their IMSA GTP counterparts. 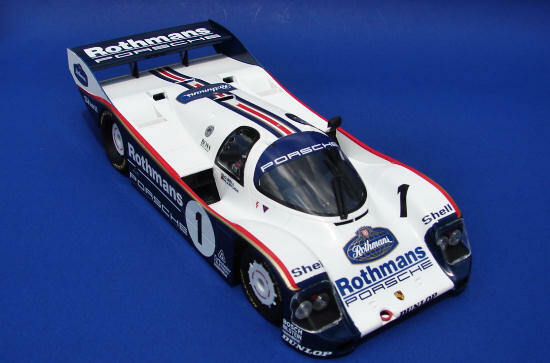 Between 1984 to 1987 the 962 would win 46 IMSA races with the 962C winning Le Mans a total of 6 times. The 962 was raced into the mid 90’s. The car this kits depicts was driven by Derek Bell and Hans Stuck to victories in the 1986 1,000km at Monza as well as the 1986 and 1987 24 hours of Le Mans. The kit is molded in white with a tree of clear parts. Four nice rubber tires are also included. The decals are nicely done, but as mentioned are incomplete. The instructions are typical Revell in that they are 2 pages with simple illustrated assembly steps. Color callouts are given in the steps and, according to my references, are accurate. Clear parts are nicely done, although a bit thick. For a look at the sprues, please visit the preview. Construction begins with the chassis. Since this is a curbside, there is really very little to do here. The rear control arms and rear framework were attached to the chassis. The entire chassis was then painted flat black. The wheels were mounted on the one-piece rims and then the center covers were added. The rear center covers, according to my references, should be larger in diameter as well as flush with the outer edge of the rim. The 962 did race without the rear covers on occasion, but the front covers were almost always used. The tire emblem decals were then added. The seat was glued into the one-piece cockpit and the shifter installed. Seat belt decals are supplied for the seat and they are passable given the limited view through the windows. The exhaust tips, tow hooks and windows were added after painting. I attached all the clear parts with Testors window glue. The cockpit was then attached inside the body shell and the body mounted on the chassis. The last parts I added were the mirrors, tires and rear wing. As stated earlier, if you want to make this car accurate, you will need to get the Rothman decals or do a different version. I obtained a set of the Speedline Rothman decals and will use these for my build. There are a few mold seams that will need to be taken care of around the front area, but nothing a few swipes with sandpaper won’t fix. Painting is really quite simple; paint the car gloss white, mask off the areas to stay white and paint the dark blue areas. Take care with the upper edge of the blue, it stops at the turn of the body and does not extend onto the top of the body. Study the painting guide closely and make sure the demarcation between white and blue falls under the decal. I painted the inside of the body flat black to minimize the dreaded “see-through” look common to these Group C curbside kits. I used Krylon paint on this kit. I normally have no trouble with Krylon, but this time it acted very strangely. After painting the body gloss white, I masked off the parts to stay white and sprayed the gloss dark blue. The body came out looking great, but the wing gave me fits. The dark blue paint came out dull. Even after a shot of clear coat, it was still dull. I striped the paint and thought perhaps the white paint had something to do with it. So I painted the wing gloss white, waited 24 hours and painted it dark blue again. The top came out looking ok, but the bottom cracked like a dry lakebed! DOH! I sanded the bottom down a bit and reshot the dark blue. It looks ok now, but you can still see hints of the cracks on the bottom side. I just don’t understand what happened… same kit, same paint. The decals are beautifully printed and have almost no carrier film outside the color. A couple will need to be cut in order to use the Speedline set, but nothing a straight edge and a sharp blade can’t take care of. I applied the corner strips first. Take care here, as they are 2-piece decals. I kinda botched the left one, but learned from my mistake on the right side. They reacted well to Microset and I had no trouble getting them to conform to the curves. I was concerned that the top stripe would not line up with the intakes in the roof, but here is were the decals show their quality. The top stripe fit perfectly! The Speedline blue Rothman nose decal is just a bit lighter then the kit decals but it’s hard to tell. It’s a shame the kit didn’t include the Rothman decals because these were, by far, some of the nicest decals I have ever used. They fit, went down with no trouble and look great! A nice kit that the novice, as well as car guys, will like. The build is very similar to the build of the Hasegawa 88C that I did recently. Anyone who has build one of the Group C kits will find it quite easy to build. To make it accurate you will need to obtain Rothman decals or do a different car. There are a lot of decals available for the 956/962 series and replacements should not be hard to find.